A radiant 21mm Venetian dichroic heart on a silver plated rolo chain. 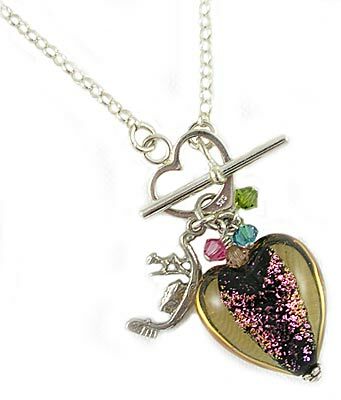 The heart is a light topaz with bright pink dichroic over a black core. Clasped with a heart-shaped toggle, this necklace features Swarovski crystal accents along side our signature sterling gondola charm. 18 inches in length.